The author of the remarkably fine The Laments (2004) returns with another deceptively modest but deeply satisfying story of an intelligent and prickly family and the difficulty of love. Tom Bedlam was born in the age of Dickens and survived well into the age of Galsworthy, and there are nods to both those greats in this tale of a bright lad in dreadful circumstances. Living with his very odd mother, who adheres to Christian principles despite mean surroundings, Tom faces a bleak future. 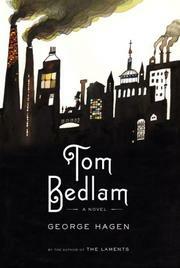 Mr. Bedlam disappeared shortly after his birth, leaving Emily Bedlam to raise the child in a tenement while she paints china in a dreadful factory in their Vauxhall neighborhood, saving pennies for Tom’s education. Life gets worse when his awful mountebank of a father returns and steals his wife’s savings. Tom has to take on the brutal job of stoking the furnaces that fire the pottery, and he fancies himself happy enough. There is, after all, the opportunity to explore the topography of his lavishly built coworker Sissy, even as he ignores the love of Audrey, one of the daughters of the large rackety Limpkin family across the landing. Then Emily’s sanity and health fail, bringing both her estranged husband and estranged father, a wealthy brewer, to her deathbed. The brewer sends Tom off to school, where he acquires manners and a start on the path to a career in medicine. At the school he is the only witness to the murder of a much-bullied friend. The murderer, in the best Dickensian tradition, will turn up later, wealthy and important. Tom, with support from the father of the murderer, becomes a doctor and a gentleman. Desperate to be the father he never had, he elopes with one of two equally loving sisters to South Africa and becomes a family man whose three daughters and one fey son draw him back to England and the terrors of the Great War. Like the Forsytes saga, worth continuing for four or five more volumes.